The Vertical Rebound Tester - Resiliometer is used to test the rebound or resilience property of rubber. First of all you need to level the machine and then raise the plunger at given height above the specimen. Now let the plunger to slide freely on its guide rod and then record the average resilience height for the 4th, 5th & 6th impacts. 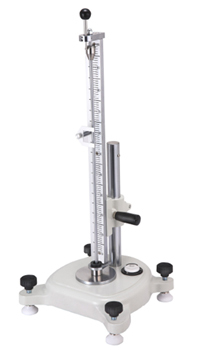 The Vertical Rebound Tester - Resiliometer is basic and conforms to the ASTM D2632 standard.